We want to see cards for guys! Our Guest Designer for this challenge is the very talented Joyce. Her blog is full of inspiring and creative projects. Take a look here and I guarantee you will come back inspired to get inky! Our sponsors for this challenge are Stampendous. The winner will get a $20 gift voucher to spend in their store. Remember our challenge is for 'Clean and Simple' cards only so we like to see lots of space on your cards. Fabulous crisp and clean masculine card. I'm sure your uncle loved it. I'm with Anita, totally James Bond! 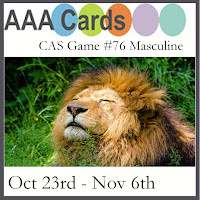 Such a fun masculine card, amazing design! Love it! Great masculine card! Love it, especially in b&w! Wow...What a fabulous card. So stylish! This is so clever and crisp, Sandie - I just love it :) The way you have stamped the sentiment down the side is a clever finishing touch too! What a great idea! Must remember this! So stylish! Sandie! This is awesome. 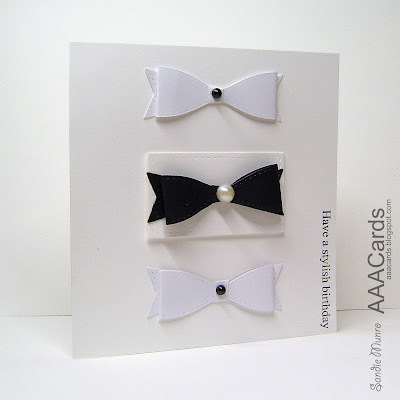 I love the way you mounted the black tie on an extra piece of card stock. I love that the white pearl is a little larger than the black ones. Really makes the black tie stand out. I love it! I love all of your bow ties. What a fantastic and elegant masculine card. WOW Sandie ! I LOVE your card ! So CAS but so effective for the theme ! Very clever and gorgeous card ! Thanks for sharing.